"Today my heart is broken, Ronnie passed away at 7:45am 16th May. Many, many friends and family were able to say their private good-byes before he peacefully passed away. Ronnie knew how much he was loved by all. We so appreciate the love and support that you have all given us. Please give us a few days of privacy to deal with this terrible loss. Please know he loved you all and his music will live on forever." 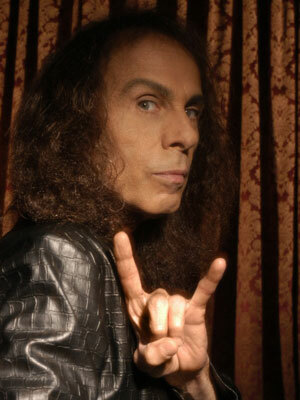 Ronnie James Dio is credited with popularizing the metal "devil horns" and was the former singer for the band DIO and Black Sabbath. Dio recently reunited with former members of Sabbath to form "Heaven & Hell" a band named after the first Black Sabbath album Dio sang on. That album is a classic and I have long thought his last studio album with Sabbath "Dehumanizer" has been highly underrated as well. Heaven and Hell's only studio album "The Devil You Know," which was released last year, is a modern masterpiece that I'm sure will be deemed as a classic with time. My heart goes out to Ronnie James Dio and his family, I'm getting really tired of making RIP posts lately. This one is particularly heartbreaking, I was hoping to catch him on tour with Heaven & Hell. To me he was never merely a replacement in Black Sabbath but a legend in his own right. He had a unique and powerful voice and was a seminal figure in Heavy Metal history.